As an SEO agency, one of the most common questions I get is how to track ROI with an ongoing SEO campaign. If you are passingly familiar with SEO, you probably know that it is a long-term game. This isn’t just some sales tactic to get a business on a retainer, it honestly takes a lot of work and that work has to be done in a very specific and somewhat scientific way in order to get results, especially for competitive business niches. SEO is a balancing act. If you do too much at one time the website may be penalized by Google which will really set back your efforts. On the other hand, if you do too little or nothing at all you will never move the needle. The point in explaining all this being, SEO is a long-term investment and as with any investment savvy business people want to know what is the ROI on that investment. So that begs the question, how do you track ROI with an SEO campaign? Well ultimately that is, of course, dependent on what your goal was with SEO, to begin with, so I will outline a few different scenarios below. One of the most common reasons that businesses reach out for SEO services is to generate leads for their service based business. In this scenario, ROI is generally gauged on lead flow comparisons over time. We normally use software like What Converts or Call Rail to help with this. What you want to look for in this scenario is lead flow from organic sources and your Google My Business profile over time. Again SEO is a long-term game, so setting realistic timelines and achievable goals are very important. Generally, in this scenario, we look at Cost per Lead (CPL) for a client and this CPL should slowly go down over time and more and more rankings are gained. For instance, if a client is paying $1000/mth for SEO and gets 10 organic leads those leads are currently costing $100/each. 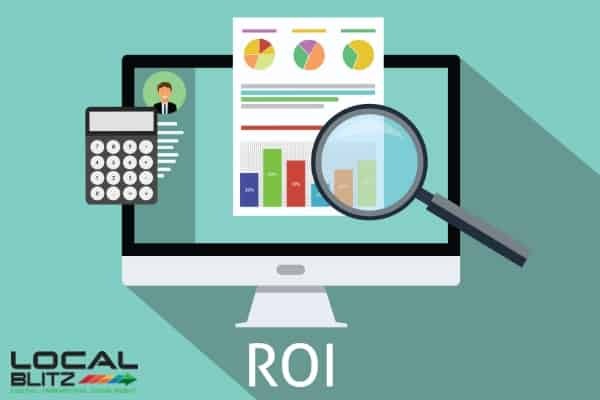 Setting a cost per lead and then a cost per client acquisition is the best strategy for determining ROI for SEO from a lead generation perspective. While this could be a very long-winded explanation, I will keep it simple. The goal of implementing SEO for Ecom is obviously more sales. As a general rule more traffic will lead to more sales, but buyer beware because not all traffic is created equally. For this type of scenario, I recommend looking at rankings and traffic and then determine based on the data how those are correlating for sales. For instance, if you are seeing a big increase in traffic but not in online sales, you may simply just be ranking now for things that are not relevant to your business. Conversely, if you see rankings way up but not traffic and sales are flat, you may be ranking for things with no search volume. This is why keyword research is so important during SEO campaigns. You must ensure that you are going after the right keywords and search terms out the gate. While some of the research may prove wrong, using free tools like Google Keyword Planner or paid tools like long tail pro, will make sure that you are at least going after keywords that have a shot in giving you not only increased traffic but also increased conversions and sales. Above I have outlined likely the two most common scenarios, but there are many others. For instance, many websites simply are paid based on traffic and sell ads on those websites. In this scenario, you will want to get as much relevant traffic as possible and would be a similar approach to the Ecom scenario previously described. It is impossible to predict every scenario for a business looking into options for SEO, but if you use the above as a guide, you should find it useful to help gauge ROI for your SEO efforts. If you are working with a trustworthy provider, they should be able to provide unbiased data points that cover all of these areas, so you are armed with information. Hope this helps and happy ranking!